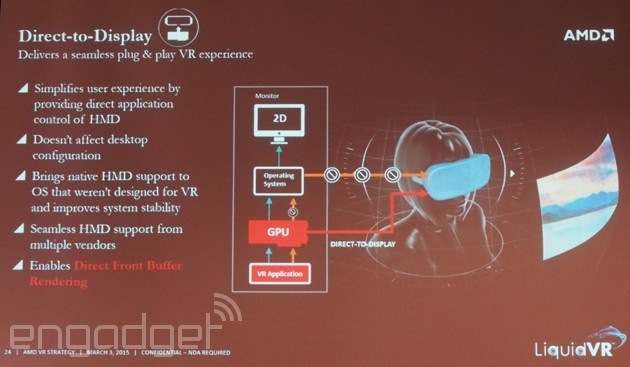 Liquid VR is AMD's first public step toward VR support, company reps said, with partnerships and more planned for the future. Oculus VR's director of engineering, Anuj Gosalia, says his company is "very excited" about the things AMD is doing in VR, and that Oculus is working on leveraging AMD's work in its own work. For instance, the ability to simply plug in a Rift headset and have it recognized as a VR headset rather than a new monitor. There are many more, far more complicated ways that the companies are working together, but this is the kind of stuff that will be invisible to most of us -- the kind of stuff that makes VR seamless. The first version of the SDK is available to "select" developers starting today; AMD is looking at this as the Alpha. When asked about whether or not AMD is also working with HTC and Valve on the HTC Vive headset, AMD reps hilariously clammed up and asked whether or not they could talk about that yet. Sounds like the answer is yes!